We lost a legend earlier this week in the passing of Stan Lee. As someone who got into comics at an older age, I didn't appreciate fully what impact Lee had until I started reading older Marvel comics. Lee, along with Jack Kirby, Steve Ditko, and others, provided the foundation for superhero comics that remains in place today. It is mind boggling that his creative efforts gifted us Spider-Man, The Incredible Hulk, The X-Men, Black Panther, and The Avengers just to name a few. Despite the impact that he had, Lee still maintained his quirkiness and is one of the most endearing creators I've ever seen. From his silly cameos in the Marvel Cinematic Universe films, to the way he interacted with his fans at conventions. There was only one Stan Lee and the comic book industry is a little darker for having lost him. A central theme in Lee's work is that of social justice and inclusion. Most of his characters were activists who were rampaging against what he considered the evils that were permeating society. Asked about the X-Men, Lee said "I wanted them to be diverse. The whole underlying principle of the X-Men was to try to be an anti-bigotry story to show there's good in every person". The impact of creating characters like Black Panther is detailed in an incredibly personal account that you should read by Jason Johnson. Marvel initially had concerns that Black Panther would be affiliated with the political movement that shared the name. Lee fought for Black Panther to keep his name and his fight to make comics diverse brought new fans to comics and provided a much needed release for people that yearned for an escape. 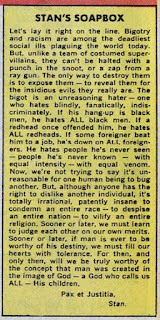 Lee penned a monthly column entitled "Stan's Soapbox" and this entry from 1968 sums up what Lee meant to the comic book industry and how he created an empire built on celebrating diversity, understanding one another, and tolerance.